Lost Season 3: "Tricia Tanaka is Dead"
Hurley is a man who's always looking for hope. Not much can get him down, he's usually a happy fellow looking for a good time and making sure everyone else has fun too. But even Hurley has rough days. With Charlie facing his imminent death, Hurley sees it as his fault and needs something to cheer him and everyone up. So, this episode he gets just that and finds an old VW van in the forest! He's a man looking to escape a curse, and he does his best to make his own luck. He's not always successful, but it's great to see him succeed this time. 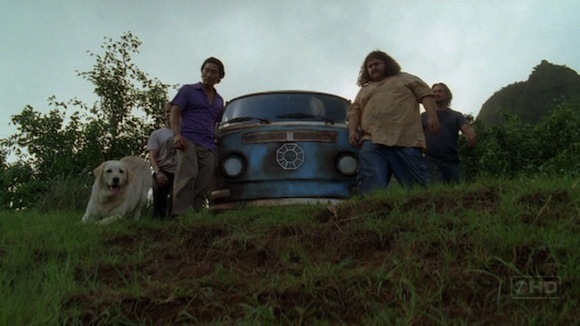 He enlists the help of Jin, Sawyer, and Charlie and they get the van moving, they get a victory. And all of them, despite everything that's gone on, have huge smiles on their face as they drive in circles in the meadow, a couple of guys with a car and some beer. They bond and they leave the day with a feeling of accomplishment. Hurley is able to share his hope with others, and every one of them left changed that day, filled with hope and happiness if only for a few short hours. And that is Hurley's gift. No matter what, even if he's cursed, he's able to help others get a new perspective, to make the most of each situation. And I must say, the curse seems to have stopped while he's on the island. Maybe his curse is broken now, but if not he certainly doesn't live in fear like he used to. Freedom has come with hope, and I hope that freedom spreads to the others, because they all desperately need it! The van will break down or run out of gas I'm sure, but they'll at least have a happy memory.